Seventeen-year-old Cassie Hobbes has lived with her Nonna and her father’s extended family since her mother, Lorelai, a stage psychic and fraudster, was presumably murdered in her dressing room when Cassie was twelve, though her body was never found. But Cassie has never fit in with her father’s family, so when Special Agent Tanner Briggs offers her the opportunity to join a unique FBI training program for young people with special talents, Cassie can’t pass it up, even though it ostensibly has nothing to do with her mother’s cold case, and even though Michael, one of the members of the program, warns her away. Cassie is a natural profiler, adept at reading people and intuiting their motivations. Standoffish Dean is a profiler like her, while inscrutable Michael reads emotions, capricious Lia detects lies, and ingenious Sloane crunches numbers better than a computer. 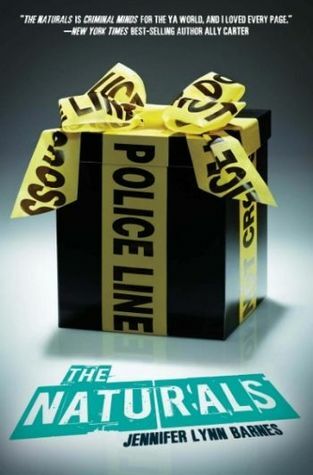 Technically, the Naturals aren’t allowed in the field, and can only work on assigned cold cases, but when Cassie’s presence in the program brings her to the attention of a serial killer, they will have to find a way to get in on the case in order to save their newest member. Fans of TV procedural crime shows from CSI to Criminal Minds will be intrigued by Jennifer Lynn Barnes’ new YA series, which throws teen drama into the middle of a crime scene. In addition to learning how to solve murders, Cassie must figure out how to navigate the unusual group dynamics amongst the Naturals, as everyone seems to be talented but damaged. As the newcomer, she never knows when she might step on a landmine, and of course, she finds herself caught romantically between Michael and Dean. This story stands alone reasonably well, but Lorelai’s disappearance is not definitively resolved, and nor does Cassie choose between her suitors. Hopefully in future books, we will get to know the characters better, and discover personalities that go beyond their natural abilities and snippets of their tragic pasts, as well as getting answers to these open questions. I especially want more for Sloane and Lia, who didn’t have much of a role to play in the conclusion of the book. Between chapters, we hear from the killer in a creepy second-person narration that mimics the style in which Cassie is taught to get inside the heads of killers when she profiles. This also keeps the reader involved in the murder mystery when Cassie’s chapters, especially early in the story, are focused more on her integration into the program rather than on the case itself. When the mystery does come to a head, the action is fast-paced and exciting. As other reviewers have noted, a few aspects of this novel stretch credulity, requiring a significant dose of willing suspension of disbelief. You have to accept the existence of both Naturals and the program that trains them, while no explanation is given for how the Naturals are identified. Some readers have complained that their abilities are also unexplained, but in my opinion there is no hint of the paranormal to require an explanation. The Naturals are gifted, but not infallible, and their abilities need to be honed in order to be useful. I had more trouble accepting that the FBI did not know about the killer’s background, once that person’s identity was revealed, than accepting the gifts of the Naturals, or the existence of their training program. These flaws aside, The Naturals was an exciting read, and I look forward to further books in the series. I’m keeping my fingers crossed for more back story and world building in the next installment.